GROHE Grohtherm 2000 – waterfall bath/shower mixer with tray and thermostat for precision control! Performance you can trust! With the water-saving GROHE Grohtherm 2000 running a bath or having a shower has never been easier – thanks to GROHE Thermostat. 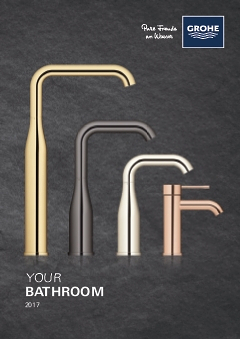 Simply choose your desired temperature and let the water flow! You can look forward to instant and constant hot water with no sudden bursts of cold if the pressure suddenly changes. With GROHE CoolTouch the thermostat is always safe to touch because its surface does not heat up – giving your bathroom a relaxing spa-style ambience. And using the GROHE AquaDimmer it’s easy to switch between the waterfall bath spout and shower, which has a handy EasyReach tray. Reliable and super safe for you to use, this shower thermostat also comes with a GROHE SafeStop feature set at 38°C which prevents children from turning up the temperature too high. It also has a scratch resistant GROHE Starlight chrome finish that will sparkle for years and it has a water-saving button that reduces water usage by up to 50% – an easy way for you to save a precious natural resource as well as money! With its wide spout and super silent water flow, this tap gives your bathroom a relaxing spa-style ambience, letting you indulge in an exceptional bathing experience.